Where is my ornamental grass?! | Faddegon's Nursery, Inc.
Where is my ornamental grass?! May 11, 2018 | Blog, What's New? If you’re new to planting ornamental grasses in your garden, you may be saying this right now. You may also be looking at tall brown stalks, half bent over, and thinking that your grass has died. Was the winter really that bad? Surprise! You are on your way to seeing those beautiful arching blades waving in the breeze again. If you didn’t cut your grass back to 6″ in late winter, then pick up your shears now! Don’t even finish reading this. Run outside and cut it back right this minute. You were lucky that April was cold, but now the weather is warming up and last year’s foliage is thwarting the new blades that are searching for sun and warmth. Now that you’ve cut back your grass you’ve joined the people who are wondering why it isn’t growing. Here’s the general rule of thumb. We need seven consecutive days of 80-degree temperatures for the ground to be warm enough to get those grasses going. Some may start a little earlier and some a bit later (there are cool season grasses and warm season grasses), but it’s more unusual than not that they just up and die. It is possible that you have a variety that genuinely needed to be cut back earlier than this. You’ll notice that the new blades are few and far between (In the spirit of full disclosure, I’ve done this. More than once). Tough it out this year with a sparse growth, get to cutting it back earlier next year and you’ll be rewarded with a big beautiful grass again next year! Watering will help if we have a dry spring just as with any plant. And don’t worry about fertilizer except when you are putting a new plant in the ground. Ornamental grasses aren’t like turf grass. They can live for years without extra nutrients, and in fact, plant food can be detrimental to the plant’s health. 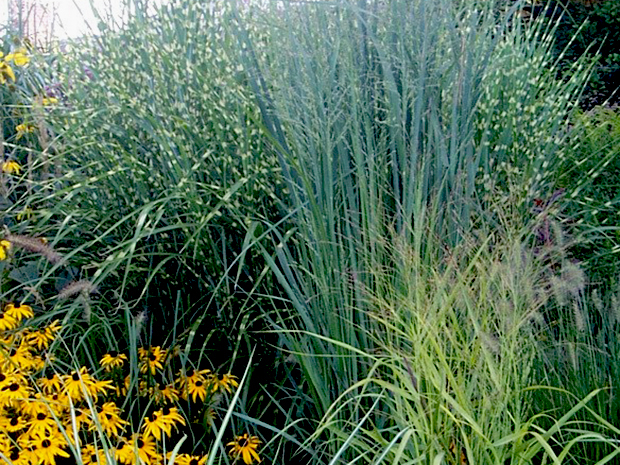 Are you wondering why late winter is the time to cut back your ornamental grass? Leaving the dead foliage intact through the winter helps to protect the crown of the plant. If you love your grass in the summer but hate the dead stalks all winter, then you can cut them, but only by half. Cutting too low can be disastrous. Grasses are super simple to grow and care for. They demand very little from you except that you cut them back at the right time. Happy gardening!